It was nearly eight years since I'd last been to Freckenham, so I thought it was about time I came back. 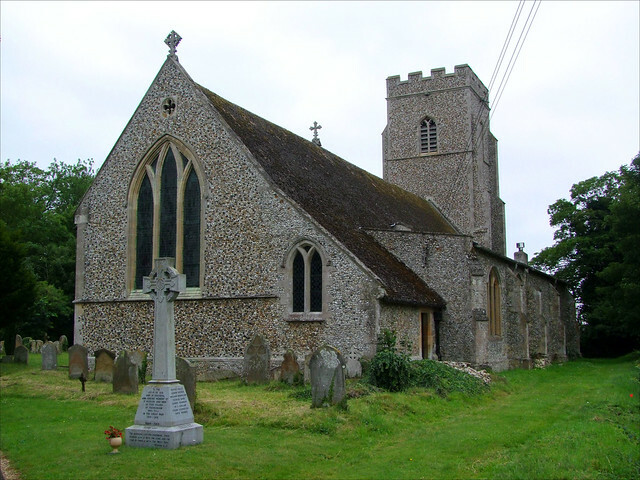 Since my last visit in 2003 I have visited most of the churches in east Cambridgeshire - I mention this because Freckenham parish, to the north of Newmarket, is surrounded on three sides by Cambridgeshire, and is one of the most westerly points in the county. I have to say that Freckenham comes as a delight if you are cycling down out of north-west Suffolk. From mile after mile of shabby agro-industrial wasteland, windswept fens and airbase-scarred prairies, you climb up into the heath. The fields get smaller, the trees cluster, the buildings are older and more picturesque. Then, just as you are about to shoot out of it and end up in Cambridgeshire, there's a hilly little village beside the infant River Lark, and a pretty church that is more typical of Suffolk than anything you've seen for miles. It is rather different if you are heading in the other direction, of course. Suffolk's borders with its neighbours rarely seem arbitrary, but they do here. Nearby busy Exning seems more like Cambridgeshire, while the Cambridgeshire village of Snailwell is just crying out to be relocated into Suffolk. Some villages on the edge of counties seem like border crossings, but Freckenham doesn't. It looks much more towards Cambridgeshire's Chippenham than it does to Mildenhall and Lakenheath, but unlike them has the feel of being a proper Suffolk village. I liked it a lot. The church sits away from the village centre, down a narrow lane that drops to the river. Your first sight of it is rather curious; a large, barn-like roof overlays nave and chancel, dropping down to enclose the 15th century north aisle which peeps out beneath it. The church was extensively restored in the second half of the 19th century, and as Mortlock observes, it was done so well that it isn't easy to tell the old from the new. The tower, for instance, which is typical 14th century Suffolk if a little overneat, was built in the 1880s after the old one collapsed. The little dormer windows at the east end of the nave which might once have lit the medieval rood are, in fact, the work of the 1870s. The architect here was George Street, and this is probably his most significant work in the county. There is no chancel arch; perhaps there once was, but now the great chancel just continues eastwards. And upwards; there are six steps between the nave and sanctuary, and the roof is high in any case. Although the colouring is modern, Mortlock thought the panelling of the restored waggon roof pre-dated Street. High above the chancel is a fantastic woodwose, looking more like something out of Greek mythology than anything English. Up in the chancel above the heavily restored piscina is a foliage head mould with a little lizard peeping out; you can see him at the bottom of the page. I'm told that there are other small creatures elsewhere. There are some curious medieval survivals in this attractive interior. Firstly, you will have spotted the bench ends. As characterful as they are, it is difficult to guage the extent to which they are restored. I suspect that most of the heads are modern; but on the woman with a rosary in particular, Street's work is so good that it is hard to say which is the medieval bit. I also like very much the devil forcing a sinner into the jaws of hell - you can see how this survived, its powerful message complementing just about any theology before the mid-20th century. Alabaster reliefs must once have been a major feature of English parish churches, but they were all removed as a result of the injunction against images issued in the early weeks of the reign of Edward VI in 1547. When William Dowsing went on his way around Suffolk a century later, he didn't find a single one still existing. Most had been destroyed; many had been sold abroad. Nottinghamshire alabasters had always had a good reputation in continental Europe, and the Anglican reformers found a ready market. Some found their way back into English churches as a result of 19th century restorations; by then, Revolution had laid waste to French and Belgian churches, and the market was moving the other way. In a few cases, the alabasters were recovered locally. That was the case at Coddenham, where an alabaster image surfaced in a village attic; and it was the case here. Set in the north aisle wall is an image that was recovered during building work in the 18th century, by which time antiquarians outnumbered iconoclasts. Mortlock thought it had been part of a reredos. It probably shows St Eligius, who, having trouble shoeing a horse, cut its legs off, shoed them, and then stuck them back on again. An appropriate image to find in this horsey country, I thought. The poor little horse here looks a little dubious about the Saint's miracle-working powers. That an image of such a minor Saint could have been made is perhaps a mark of how much we have lost. Finally, just to show that the Victorians were not consistently a Good Thing, note the horrible stone pulpit, and wonder whatever could have possessed them to do it.